As a classroom teacher I looked forward every year to teaching students all kinds of academic concepts and skills that would enable them to be engaged and successful in their learning. Organizing book clubs to get them thinking about themes and character traits, guiding research on how animals adapt to their environment, teaching the rock cycle or multiplication—I relished them all. And there was one other thing that I enjoyed teaching just as much: positive time-out. 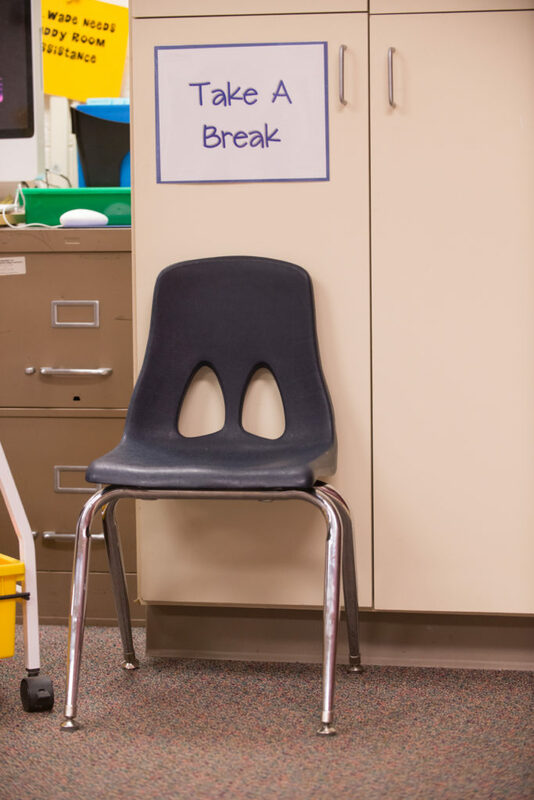 Many teachers know how to use time-out not as a form of punishment, but as a judgment-free, matter-of-fact way to respond to a student’s misbehavior while maintaining the momentum of learning in the classroom. But what’s even more powerful is that we can use time-out as part of our efforts to teach students to self-regulate—to recognize when they’re getting frustrated or just losing focus, and to give themselves a break so they can regroup and return to productive learning. It was Martin, a third grader I taught, who gave me the opportunity to learn how this strategy can be used for self-regulation. Martin was a happy but easily frustrated child. When confronted with a difficulty, his tension would quickly build into crying and yelling. At first I used time-out only as a response to his outbursts. Gradually, however, I figured out how to teach Martin to use these breaks himself to prevent outbursts. Through that experience, I learned these key steps for guiding children toward developing self-regulation skills. I carefully presented time-out as something that can help anyone stay calm and focused. I introduced it after establishing class rules with students and discussing the rules in a way that gained their investment. I then told them that everyone forgets or has trouble following the rules sometimes, and in this classroom, when that happened to someone I would help them out in several ways, including using words or a nonverbal cue to remind them, having them come sit next to me—or having them step away from the action to pull themselves together. When I first started using this technique, I tended to wait until a child was clearly out of control. Over time, I learned instead to have a child take a break at the first sign of tension. For example, one day while conferring with students during math workshop, I looked up to check how Martin was doing with his multiplication problems. It was clear that he was getting frustrated because his brow was furrowed, his pencil was tossed off to the side, and he was staring hard at the math problems while sighing loudly. For some children these might just be signs that they’re working through something they’re stuck on and not necessarily reason to intervene. But I knew Martin well enough to recognize that for him, these were sure signs of an outburst about to happen. I calmly walked over to Martin and told him to take a break. The advantage of directing a child to take a break early like this, before the furrowed brow grows into yelling and a red face streaming with tears, is that the child usually recovers faster and is spared the unsettling feeling of having had an outburst in front of everyone in the class. More importantly, it shows the child how effective taking a break can be, which encourages them to choose that option themselves in other frustrating situations. Of course, to know when a child could use a break means we need to learn what tends to trigger their tension and to recognize their signs of frustration, and that requires careful observation. For example, after watching Martin closely for a few days I saw that certain things quickly frustrated him: difficult math problems, being unable to do something the first time he tried, and feeling that his classmates weren’t hearing him. As for his signs of tension, besides the wrinkled brow, cast-aside pencil, and hard stare, there were the clenched fists and the color in his face slowly becoming deepening shades of scarlet. For other children, the triggers could be too much noise or too much sitting, feeling bored or feeling hungry, and signs of tension could be anything from hard frowning to frenetic pencil tapping. Every child is different, so the key is to observe carefully and look for patterns. To learn to voluntarily take breaks, children need to recognize when they’re getting upset or starting to lose focus. We can help them. The day that I told Martin to take a break during math workshop, as the class settled into reading time after recess, I checked in with Martin privately to explain what I had noticed and why I thought he needed a break. I shared with him what his frustration signs looked like to me and asked if he had noticed the same thing. The whole conversation took less than a minute. Like some children, Martin did not initially recognize his triggers or his signs of frustration. Over time, with reflective conversation, I helped him become aware of his triggers and connect his feelings to his observable signs. As Martin became more self-aware in this way, we were able to rehearse taking a break. During an afternoon workshop time, when Martin tended to be calm, we’d pretend he was noticing his signs of frustration and he’d walk over to the break area to calm down. These rehearsals took just a couple of minutes and were critical to his eventual ability to self-regulate in real moments of frustration. Other children may already be aware of how they exhibit their emotions. Even so, they may still need help understanding that when they notice their signs of tension, it’s time to take a break. Sometimes it’s enough to hold occasional whole-class discussions about this. Other times teachers need to practice one-on-one with individual students as I did with Martin. Although Martin began taking breaks when he got frustrated, he was slow to calm down and sometimes would still turn bright red and burst into tears during the break. Clearly, if children like Martin are to get the full benefit of time-out, we need to teach them some calming strategies to use while there, such as deep breathing, doing wall push-ups, or visualizing a favorite place. Having a small basket of things on hand like stress balls for children to squeeze and puzzles that can take their minds off their frustration can also help. With Martin, I named a few of these strategies and asked which he thought might work for him. He wanted to try deep breathing, something he’d tried before as a way to recover from his outbursts. I knew, however, that I’d have to scaffold this skill for him because his previous attempts to breathe deeply were actually quick shallow breaths taken while still persevering on what had initially fueled his frustration. I suggested a strategy that the school psychologist had taught another student—blowing soap bubbles. But not just any bubbles. While taking a break, Martin was to blow the biggest bubble he could. This accomplished two things. One, it encouraged him to take long, deep breaths. Two, it turned his focus away from what was frustrating to the task of blowing the biggest possible bubble. A final word about calming strategies: It’s important to help students connect their use of a calming strategy to their regained feeling of calm so they’ll see how the strategy helps. This can be as simple as saying, “I see that deep breathing helped you feel calm again” when they return from their break to their previous classroom activity. If we consistently and skillfully guide students to use time-out for self-regulation, we’ll gradually see them put this tool to good use. Not only that, we may see them begin to apply the strategies to situations they face in the course of their day, without having to physically remove themselves to the break area. One day while conferring with groups on their fractions work, I looked up to check on Martin. As he was talking to his classmates about the problem they were working on, his brow wrinkled—a sure sign of his frustration. I watched for a moment more to see what he would do next. He put up an index finger to signal his classmates to wait a moment. He then turned around, took a few deep breaths, turned back to his classmates—minus the scrunched brow—and continued conversing calmly with them. That’s when I knew that helping Martin self-regulate his response to frustration was really working. Tracy Mercier is a Responsive Classroom consultant. She has taught grades three, four, and five in diverse classrooms in Connecticut and Massachusetts.